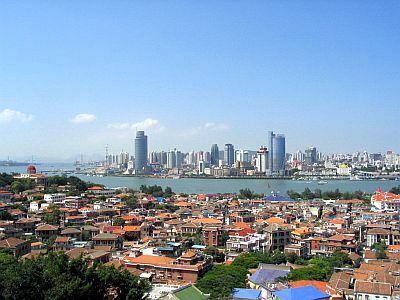 In Xiamen (formerly known as Amoy), and on the small neighboring island of Gulangyu (a UNESCO World Heritage Site), the climate is subtropical, with mild winters and hot, rainy, and muggy summers (due to the monsoon). The city is also an island, and it's located in southeastern China, in the province of Fujian. At a short distance, we find other small islands, belonging to Taiwan, the Kinmen Islands (or Jinmen). Rainfall is around 1,200 millimeters (48 inches) per year: this area is a little less rainy than the neighboring provinces (Zhejiang and Guangdong). The rainiest period is from April to September, when rainfall exceeds 100 mm (4 in) per month, while the least rainy period is from November to January, when it drops below 40 mm (1,6 in) per month. Here is the average precipitation. Winter, from December to February, is mild, with highs around 17 °C/19 °C (63 °F/67 °F). The sun, which shines roughly half the time in December, gradually becomes less frequent, and there are more and more days with cloudy skies, fog and drizzle. There may also be windy days. Some days can be pleasantly warm, while in others, the temperature can drop to around 10/15 °C (50/59 °F) during the day, and the wind can also blow, increasing the feeling of cold. Occasionally, it can even get cold, with lows around 5 °C (41 °F) and highs around 10 °C (50 °F). Spring, from March to May, is very mild or pleasantly warm, but the sky is almost always cloudy, in addition, there may be fog in March and April. In March, a cold wind can still blow, with highs around 13/15 °C (55/59 °F), especially in the first half of the month. In April, with the increase in temperature, the first thunderstorms can occur. In May, the weather is often already hot and sultry, though less than in the summer months. The long summer, from June to September, is hot, humid, and rainy. June is the wettest month, and it is not very sunny, then the situation improves a bit. Daytime temperatures are around 30/32 °C (86/90 °F). High humidity produces an uncomfortable feeling, but luckily, the breeze blows from the sea. Usually, sticky heat lingers even at night: lows rarely drop below 25 °C (77 °F), but they can also remain around 28/29 °C (82/84 °F). On sunny days, the temperature can reach 35 °C (95 °F). In July, there is often a pause, a period of good weather lasting a week or two. The probability of typhoons, which bring heavy rains and strong winds for a few days, with the risk of flooding and landslides, is highest in this season. In the short autumn, in October and November, the rains become rare and generally not abundant, and the sun is more frequent than in spring. In the first part of October, the weather can still be hot and muggy, but then it gradually becomes more pleasant; in this month, however, and sometimes even in the first half of November, tropical cyclones can still arrive. In November, the temperature is generally pleasant, with highs around 24 °C (75 °F), but cool and windy days gradually become more likely, and sometimes, in the second part of the month, it can get a bit cold. The amount of sunshine in Xiamen is not great all year round, and it's scarce from February to May, when the sky is often overcast. In July and August, the sun shines paradoxically more often, since the rains occur in the form of downpours or thunderstorms, which do not last long, so the sun comes back after a while, except when typhoons hit the area. In autumn, the amount of sunshine remains acceptable or improves slightly, however, cloudy days are possible in this season as well. The sea is warm enough for swimming from May to October, and it becomes pleasantly warm from June to September. In winter, the South China Sea at this latitude is quite cool, if not cold: it drops to 17 °C (63 °F) in January and February. 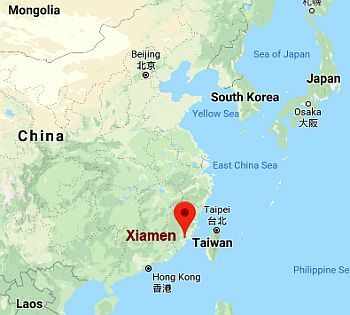 As mentioned earlier, Xiamen can be hit by typhoons, the tropical cyclones of Southeast Asia. Typically, typhoons occur in this area from June to early November, but they have sometimes affected this area outside of this period, as happened in May 2006 with Typhoon Chanchu (or Caloy). It's not easy to find the best time to visit Xiamen. Winter can be a good period, but it is not so mild, in addition, the sky is often cloudy in the second part; moreover, it can be windy, and sometimes, though rarely, it can be a little cold. Spring is mild or pleasantly warm, but it's also cloudy and rainy, then, by May, the air becomes muggy and there is some risk (though still low) of typhoons. In theory, autumn is the best season, but a typhoon can still occur in October, while in November, there can be the first cool and windy days, and sometimes, at the end of the month, it can already be a little cold. All in all, the best times are the month of April, and from mid-October to late November. Those who stand the heat can also choose the July-September period. In winter: bring spring/autumn clothes, a sweatshirt or sweater, a jacket, a raincoat or umbrella, and a hat for colder days. In summer: bring tropics-friendly, lightweight clothing, a light sweatshirt for air-conditioned places, and a light raincoat or umbrella.